Sue Blackshear has spent her life as an artist, educator and political activist, largely in New Orleans, Alabama and Iowa, with time in Germany and New York. Sue moved to Quail Springs in August of 2016 to be near her daughter and son-in-law, Jan Smith and Brenton Kelly, long time core staff of Quail Springs, and to explore living the permaculture life style as an elder. She is convinced that what is happening at this permaculture center in the high desert of Southern California is very important. 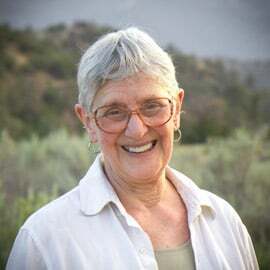 She sees the work being done at Quail Springs by a dedicated, multi-talented staff as setting an example of a healthy, sustainable path for any who are concerned about the future of life on this planet. Sue continues to paint prolifically, teach private and group art lessons in painting and drawing, and present her art work in southern California. Her work is in private and public collections around the world.